For more details, visit the new DAY1 Website! Day1 is a finishing aid that lubricates the surface for faster, easier finishing. Day1 can also extend workable time by 15 to 30 minutes, even under adverse conditions such as high wind, heat, or low humidity. Day1 eliminates the need to add water to the surface which can be detrimental to the surface performance of the slab. It can also be used to help finish shake on hardeners in low bleedwater environments. Day1 is a safety net, giving finishers more time on the slab. Day1, applied during finishing, provides a number long term of benefits to cured concrete, as well. Day1 has been shown to reduce surface evaporation, mitigating and reducing slab curling and differential shrinkage. Day1 also has densification properties and reduces efflorescence in colored and standard concrete. Lythic DAY1 Troweling Aid, Densifier and Curing Agent is a colloidal silica-based topical additive that makes concrete flatwork finishing easier and faster, and produces a better result. Applied during floating and troweling, Lythic DAY1 lubricates the surface for easier, faster finishing, increases cream for a better finish, significantly extends workability time under adverse conditions, slows surface drying and premature set, and eliminates the need for adding water during finishing. It provides moisture-retention performance like a liquid membrane forming curing compound; however, no membrane is formed. Retards surface for 15 to 45 min, depending on conditions. Helps eliminate false set of surface that causes delaminating caused by premature finishing. Helps prevent surface “checking” caused by accelerated surface drying. Reduces operator fatigue, enables finisher to “close” surface of concrete more easily with less resistance on tools and a lubricating effects of gel from the silica reaction. Reduces wear and tear on power-trowel blades. Eliminates need to return to jobsite and seal the concrete. 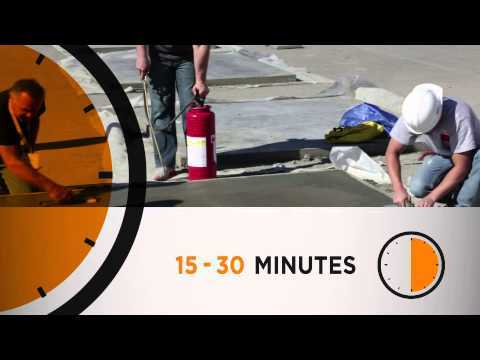 Saves customer and contractors time and money by eliminating many call-backs for poor or incomplete finish caused by weather conditions or fast set of concrete surface. Closes surface pores of slab. Slows evaporation of water during final set and subsequent curing. Aids in proper curing due to retention of water. Helps strengthen bond between concrete’s surface layer and inner slab. Becomes a permanent part of the slab surface, acting like a sealer in that the surface repels water. It remains breathable, but at a reduced rate relative to conventionally finished concrete. Helps prevent surface freeze/thaw damage by resisting water absorption. Helps prevent Alkali Silica Reaction (ASR). Ties up excess calcium hydroxide, preventing salts from accessing lime and damaging concrete surface. Helps concrete resist freeze/thaw cycles that can damage surface. Eliminates dusting due to poor finishing practice when water is used as a finishing aid. When placing a concrete slab, you want everything to be perfect. But of course, it never is. Wind, heat, low humidity, even strong sunshine can dry out the surface, or cause it to set prematurely, before you can finish it properly. “Losing the slab” is every concrete contractor’s nightmare, because fixing it can eat up all the profits of a job. There is a new product that can save a concrete finisher from this unpleasant outcome. DAY1 Finishing Aid, from Lythic Solutions, truly represents a new category of product. It is not a film-forming or membrane-forming compound, but it helps keeps moisture in the slab. It is not a chemical set-retarder, but it helps keep the surface workable longer and brings up more cream for a smooth, easy finish. Best of all, it eliminates the need to add excess water (“blessing the slab”) during finishing. Added water weakens concrete. It raises the water/cement (w/c) ratio, and a low w/c ratio is one of the key factors in concrete strength. When water is added to the surface, it weakens the surface and makes it more porous. The surface is more vulnerable to wear, and liquids can get into it more easily, including staining liquids. Blessing the slab is especially bad for colored concrete, since it can cause color shifts and matching problems. DAY1, on the other hand, gives you the workability you need without raising the w/c ratio, so it doesn’t damage the long-term performance of the surface, and it doesn’t affect color. DAY1 is sprayed on the slab as soon as the concrete is screeded off, and then bull-floated into the surface. It contains colloidal silica, a densifier that reacts with the lime (calcium hydroxide) in the cement, and turns it into useful cement paste. This increases the amount of cement paste, and improves its quality, making it easier to close the holes quickly without adding excess water. DAY1 slows down evaporation through the surface, too, protecting the concrete from moisture loss. When the slab has set enough to start troweling, DAY1 is applied again, and troweled into the surface. It lubricates troweling. You can hear the power-trowel speed up the moment it’s sprayed on. It raises the cream and eliminates the need for “blessing the slab” with excess water. For the finisher, it means a buttery surface to work with. It also means that sun, heat, wind, and low humidity will not dry out the surface as quickly. It stays workable longer, about 15-45 minutes longer. This effect was tested at World of Concrete 2013 in side-by side “torture-tests.” Fresh slabs were poured over hot asphalt three times a day, in the bright sun and dry air of Las Vegas. They were hot mixes, designed to set up fast. Under these extreme conditions, they often set completely in less than 45 minutes. There were three slabs in each pour: one finished with water, one finished with DAY1, and one finished “dry.” Professional finishers from all over the world volunteered to run the trowels and test the performance of the finishing aid. Workability was timed. On the best set of slabs, the “dry” slab lasted 115 minutes, the water-added slab 135 minutes, and the DAY1 slab 160 minutes. That extra 45 minutes is 39% more finishing time. On the most extreme pour, the dry slab was gone in 20 minutes, the water-added slab in 22 minutes, but the DAY1 slab was workable for 35 minutes, an increase of 122%! Contractors have also reported using it to solve a variety of special problems. Poppoff used it in a food processing facility that was specified to receive one pound of shake-on hardener for every square foot of floor. “We couldn’t get the hardener worked in. Trying to work a bunch of powder into concrete, it dries out the surface.” They added DAY1, and the cream rose. They were able to work in all the hardener they needed. One question that often arises concerning DAY1 is the fact that it is a water-based treatment, so it is adding water to the surface. Normally, that would be expected to raise the w/c ratio, which, as mentioned earlier, is bad for the concrete. In fact, DAY1 lowers the w/c ratio. DAY1 adds much less liquid to concrete than blessing the slab with water. The typical finisher using DAY1 adds only about 20% of the total liquid he would add if using water. More important, the liquid and the silica in DAY1 react with calcium hydroxide, making additional useful cement paste. This reaction actually uses up more water than is added with DAY1. It bind excess water that’s in the concrete for workability but is not actually needed to react the cement, reducing bleed water. Thereby, it lowers the w/c ratio at the surface, making the surface harder and more durable. DAY1 is available through the Solomon Colors/Brickform network. It ships as a concentrate to save shipping costs and lower the environmental impacts of transportation. It is available in 1-gallon and 5-gallon packages, which are diluted 4:1 with water to make 5 gallons and 25 gallons, respectively. It is applied at a rate of 1000sf/gal. For example, 1 gallon of concentrate makes 5 gallons of ready-to-use mixture (RTU), which covers about 5000 sf. Another interesting effect of DAY1 has been observed on some jobsites: the DAY1 smile. It appears on the faces of finishers the first time they try edging or hand-troweling with DAY1. It was first documented at World of Concrete, and has since been observed in many locations where DAY1 is in use.